Astralin (f. by Stratum). Winner at 1200m, 2d BRC Eidsvold Race Club H., XXXX Gold H.
Raven Raider (g. by Carry the Flag). 2 wins at 1000m, 1200m in Aust. Realign (f. by Reward for Effort). Winner at 1000m in 2018-19 in Aust. Panagiota (f. by Reward for Effort). Winner. See below. Kiralim (f. by Easy Rocking). Winner at 850m in Aust. Bowhunter (Kashani). 7 wins at 1200m, 1400m, A$353,145, VRC Geoffrey Levett H., MRC Beechcraft H., Australia Day H., Gippsland Sprint Series Heat 4 H., 2d VRC Standish H., Gr.3, Kokoda Track H., MVRC Citypac Home Loans H., MRC Gippsland Sprint Final, Grange H., Syntax H., MVRC Members Tour to Hong Kong H., 3d VRC Kensington S., L, Red Tempo Sprint H., MRC Gippsland Sprint Final, Torbek H., Geelong RC Petstock Animal Supplies H.
Smart Dart (Bel Esprit). 9 wins to 1200m, A$308,430, Pakenham RC Sportsbet Racing Form H., MVRC Sandwich Chefs H., 2d MRC Darren Gauci Farewell H., WIlliam Hill Own the Moment H., 3d MRC Christmas S., L, Bushnell Outdoor Products H., Wangaratta TC VOBIS Gold Eldorado, Bendigo JC Woodside Park Stud H.
Comin'through - Here He Comes (Aust.) (Bullbars). 3 wins at 2000m, 2100m, NZ$117,120, A$18,000, ARC Swisse Wellness Trophy H., Barfoot & Thompson H., 2d Counties RC Ssangyong H., 3d ARC City of Auckland Cup, Gr.3, Coca-Cola H., Mondiale H., Auckland Eye H., 4th BRC Grand Prix S., Gr.3, Hawke's Bay Cup, L.
Comahni. 5 wins from 1200m to 1600m, A$98,250, 2d BRC Buccini Transport H., SCTC XXXX H.-twice, 3d BRC Timeform.com.au H., Programmed Corporate Imaging H., Cox Rayner Architects H., Ambassador Travel H.
King Ragnar. 3 wins at 1000m, 1200m in 2017-18, SCTC Butler McDermott Lawyers P., 2d SCTC Sky Thoroughbred Central P.
Dotherighthing. 6 wins to 1300m to 2017-18 in Aust. Limarki. 7 wins to 1500m, A$96,980, QTC XXXX Gold H.-twice, Killawarra Dusk H., Kaoru Star P., BTC Jubilee Hotel H., 2d QTC Breakfast Creek Cricket Club P.
Malumba. 3 wins at 1400m, 1600m, 2d BTC Cleanevent H., QTC JM Kelly Project Builders H.
Ch'eonjeongch'eon. 6 wins from 1000m to 1800m in Korea. Producer. Analign. 3 wins. See above. Say I Do - Happy Guy (Mac.). 4 wins at 1000m, 1200m in Macau, 2d MVRC Don Deli Supreme H., 3d MVRC Qantas Flight Deck H., VATC Blazing Saddles H.
ONE MAN OUT (Just a Dancer). 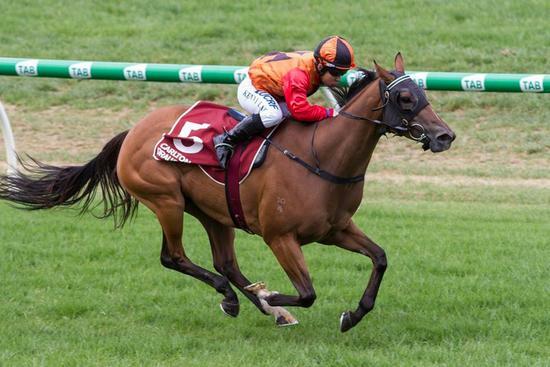 6 wins from 1500m to 2400m, NZ$6,300, A$168,548, AJC Warwick Farm Spring Cup, L, MVRC Dominant Chemicals H., AJC Chester H., A MacKellar H., 3d Qld Tatt's RC Tattersall's Cup, Gr.3.